Mildew is also known as ‘downy mildew’ and as the disease spreads, the leaves curl up, necrotize and eventually fall off. The parts of the mycelium that contain the spores of the fungus emerge through the stomata of the plant. In good light it can readily be identified by the gray or purple felt like covering on the back of the leaves. The term mildew refers to a group of phytopathogenic fungi that causes diseases in plants. In general, mildew is found on the upper side of the leaf, but there are exceptions. One type of mildew only grows on the underside of the leaf. The leaf looks as if it has been dusted with powder. Keep humidity low and keep your growing area clean. 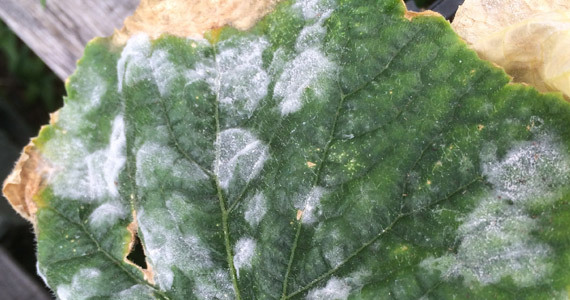 Powdery mildew is also known as Oidium. Before any symptoms become visible the leaf starts to develop blister-like patches, which is followed by the characteristic white powder where the blister was. The leaf looks as if it has been dusted with powder. In general, mildew is found on the upper side of the leaf, but there are exceptions. 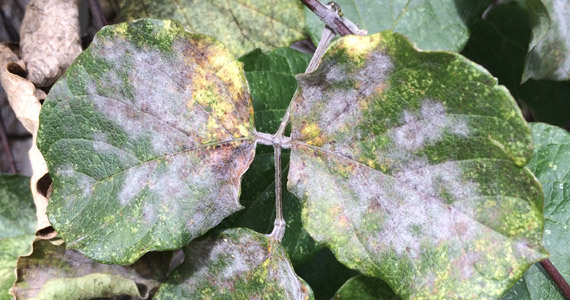 One type of mildew only grows on the underside of the leaf, so it’s no surprise that this often gets overlooked. However, as the disease advances, the leaves can end up being completely covered in this white layer and it can even colonize the fruits, with subsequent losses in crop size and quality. How to prevent the disease? The best treatment against these types of fungi is prevention; once they have set in and developed, they are very difficult to eradicate, sometimes even with chemical fungicides. Try to prevent spores coming in from elsewhere and contaminating your plants by keeping your growing area clean. You can do this by using only clean equipment and washing your hands thoroughly before entering. Check older leaves regularly for light yellow discoloration and fungal growth. You can remove suspicious leaves and keep these in a re-sealable freezer bag along with some moist paper in a warm place. After two days you can check the leaves for mildew, maybe using a magnifying glass. Remove any contaminated leaves, but also make sure that you don’t spread the disease yourself. Make sure that you wash your hands regularly, preferably with an alcohol solution. Remove infected materials totally from the growing area and dispose promptly and off property. Don’t forget that you will need to repeat the spraying several times.